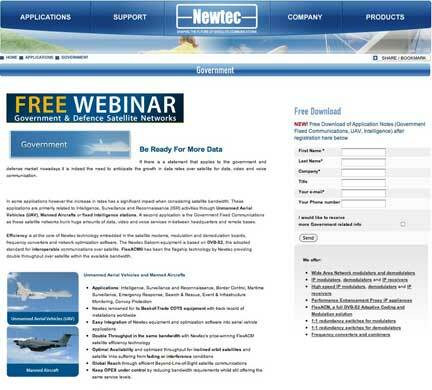 Newtec's Free Webinar... How Much Growth And How Much $? Newtec will be hosting two special free webinars on government satellite ...Newtec free Webinar: Government Satellite Networks - Tuesday, Dec 13 to Wednesday, Dec 14 This is a virtual event at. If there is a statement that applies to the government and defense market nowadays it is the need to anticipate the growth in data rates over satellite for data, video and voice communication. There is a trend in the U.S., now being seen worldwide, of a rapidly increasing demand for communications over satellite. This is driven by the increasing numbers and video plus data traffic by Unmanned Aerial Vehicles (UAVs) and manned aircrafts, as well as advances in fixed government communications and national security technologies. Newtec has identified these needs and translated them in e.g. the FlexACM technology (www.newtec.eu/FlexACM). However, when combined, FlexACM helps government and defense customers to get the very most out of the bandwidth available to them, doubling on average the throughput and pushing down operational costs. While in operation the satellite link remains available at all times to ensure mission critical communications. Newtec's solutions have been deployed on platforms supporting UAVs and manned aircrafts; as well as government fixed communications; Morale, Welfare and Recreation (MWR), intelligence through Commercial Off-The-Shelf (COTS) satellite communication equipment. In some applications however the increase in rates has a significant impact when considering satellite bandwidth. These applications are primarily related to Intelligence, Surveillance and Reconnaissance (ISR) activities through Unmanned Aerial Vehicles (UAV), Manned Aircrafts or fixed Intelligence stations. A second application is the Government Fixed Communications as these satellite networks trunk huge amounts of data, video and voice services in-between headquarters and remote bases. Efficiency is at the core of Newtec technology embedded in the satellite modems, modulation and demodulation boards, frequency converters and network optimization software. The Newtec Satcom equipment is based on DVB-S2, the adopted standard for interoperable communications over satellite. FlexACM® has been the flagship technology by Newtec providing double throughput over satellite within the available bandwidth. Register here for Session 1. Register here for Session 2.